This week’s free app from Apple is Flowing. Normally $3, it’s free for a week on your iPhone and iPad. Continue reading for our review and recommendation if it’s worth a download. 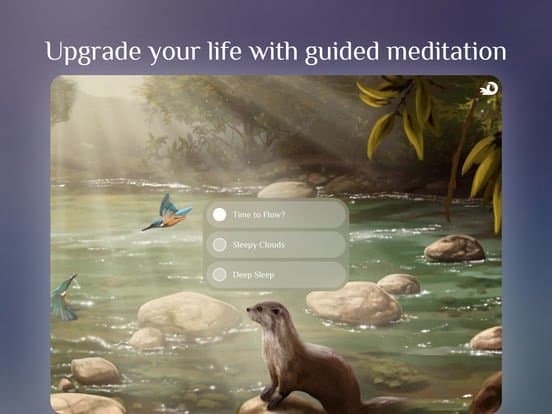 This week’s free app is the sound and meditation app Flowing. Normally it’s $3, but you can get it free from iTunes until Thursday, October 6th. Flowing is a little bit white noise, a little bit meditation, and a little bit relaxation app. The white noise has settings for meditation music, raindrops, birds, and running water. The app gives you three music choices and lets you control the amount and mix of other noises. Most white noise apps I’ve used, even free ones, give you more control than Flowing. I found you can only control the intensity of the sound elements, not the variety. For the meditation, Flowing gives you a deep sleep, a light sleep, and general relaxation option. The narrator has a dreamy voice that borders on the ridiculous. She seems to be trying way too hard to sound like she’s wants to relax you from another world. 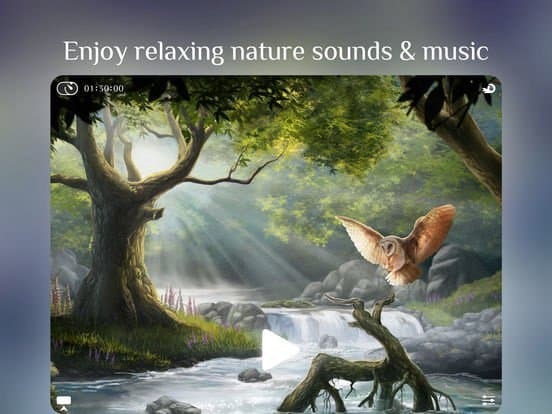 The relaxation includes the white noise, meditation, and 3D parallax nature scenes. As you move your iPhone or iPad, the scene moves with you. The art in the app was creepy. It reminded me of stuff I’d see in a rundown hotel or restaurant. In particular, the 3D animals eyes followed you everywhere. I serious! I’m not paranoid! If you want other scenes, Flowing includes ads for some of their other apps like Sunny. Someone who likes meditation and white noise apps along with a little variety in what they listen to may enjoy this app. I wouldn’t pay money for it personally, but the meditations give me a little variety. I’d keep this app in the background while I’m working with headphones and can’t stream music. The 3D art… I’d let the kids play with. Kids like creepy stuff and would enjoy seeing the art move as they play with the iOS device. This simple app ran without hesitation on my iPhone 5s. It takes up 100 MB, so it’s not a space hog. I’ll keep it around for a quick meditation break or just to entertain the kids.